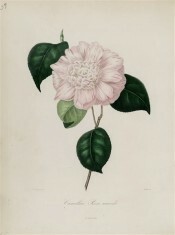 A cultivar of Camellia japonica L., ‘Rosa Mundi’ has well formed double flowers, to 7cm across, the petals having a white ground spotted and striped with crimson. [ICR]. It was bred by George Press, another seedling of a cross between ‘Semi-duplex’ and ‘Alba simplex’. [ICR]. ‘This was raised by Mr. Press, a few years since, from seeds. It forms a beautiful variety, flowering freely.’ [LBC no.1866/1834]. Berlèse Iconographie vol.I pl.38/1841. Listed in the 1845, 1850 and 1857 catalogues [T.256/1845]. Probably obtained from Loddiges’ Nursery, either in a case of plants brought back by Bidwill or in a direct importation in late 1844. Concerning the latter Macarthur wrote on 6th January 1845 that he now had five camellia ‘which we had not before’, and of the former that he had saved 60% of the plants: ‘You will judge therefore how much I am in your debt’. [MP A2933-2, p.28]. Berlèse seems to relate Rosa mundi to Punctata plena, together with Splendidi and Venusta. See Camellia japonica ‘Punctata’ for more information. [Berlèse Monography p.91/1838].